Married, Elizabeth Bryant, 3 January 1850, Launceston, Tasmania, Australia. Born, about 1803 in Wiltshire, England. Born, about 1806 in Wiltshire, England. 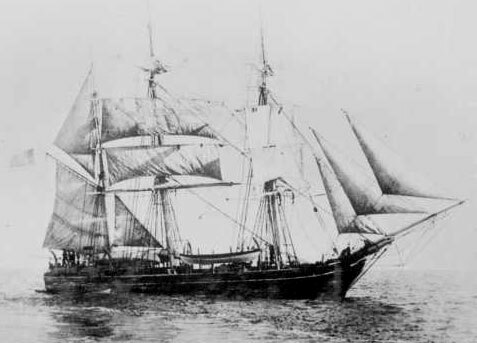 Christened, 10 February 1833, Tasmania, Australia. Married, William Burcher Kingswell, 3 January 1850, Launceston, Tasmania, Australia. Died, 4 April 1894, Bluff, NZ. A key detail of this generation of the Kingswell family is not confirmed. Primary records (births, deaths and marriage records) along with shipping registers, correspondence, George Herbert Kingswell’s biography and the Kingswell family bible disagree, in one significant area. Who was the mother of the second daughter, Mary Hilder Kingswell. Several sources (including the oral history of W B Kingswell’s own sister) states that the mother’s maiden name was Hilder – and connected to the Chichester family of the Donegal Earldom. I’ve listed Mary Hilder, who is the mother of Mary Bryant, as being the source of the Hilder link. Other evidence is of the family christening gown, from this period, is said to be embroidered with the Donegal pattern. This gown is in the possession of the Australian branch of the Gillow family. There is now so much information on W B Kingswell he has a seperate biography page here. List of the children of William B Kingswell & Elizabeth Bryant. The full details of this interesting family are here. Married, William Burcher Kingswell, 1850, Tasmania, Australia. Died, 4 April 1894, Morningside, Bluff, NZ. Little is yet known of her background. I’ve added Mary as her middle name as this was listed as her middle name by her son Edwin Kingswell in his marriage record (Canada September 1908). James Bryant, From the History of Devon Cattle. Arrives 4 Feb 1825 in Tasmania. In Dec 1825 he is listed as ‘Mr. James Bryant, at Jerico’ in Hobart. Granted land ‘Sand Hill’ at Jerico and Eastern Marshes with his brother Edmund Bryant. Devon cattle continued to be raised there until 1845. James Bryant, has sheep stolen from his property, in 1835. Born, about 1803, England. (either in Castle Combe, Wiltshire, or Tunbridge Wells, Kent). Married Mary Burcher, St. George Church, Middlesex. 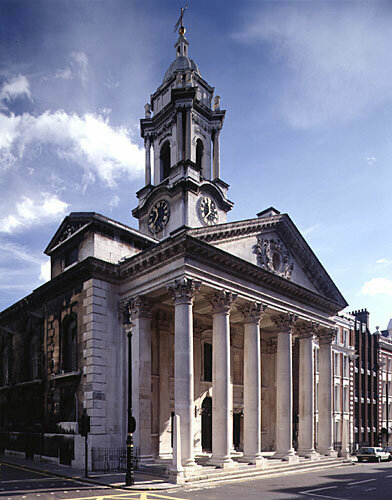 Their marriage at St. George, Hanover Square, in the County of Middlesex – on 23 October – 1823. Listed in “The register book of marriages belonging to the parish of St. George, Hanover Square, in the County of Middlesex” edited by John H. Chapman. Snippet of page 227 found in Google books. St. George is pictured right and has remained largely unchanged. A letter to George Gillow from Mr. E. Ingledew dated 17 March 1934. Which reports the recollection of their daughter, Sarah Kingswell. Mary Kingswell, wife, born circa 1806 and their four children (as below). “Kingswell, William, age 40, Passenger on the ‘Elizabeth’, from Launceston, arriving 12 May 1846 with the remarks of ‘Merchant/Hampshire/Visitor'”. In this index there are also seven other listings for W Kingswell in the date range 1846 and 1847 and all between Launceston, Twofold Bay, Moreton Bay, Circular Head and Pt Phillip. My assumption is that Kingswell and Towgood where either unable to afford the repair costs or left town! I feel it is safe to assume that the W. Kingswell mentioned is William Kingswell (there are no unaccounted for Kingswell’s in Australia during this period) and in the same book William Kingswell is listed as being a passenger on this ship in 1839 (there being only room for four berths). In the Mr E Ingledew letter he mentions that W Kingswell was for a time a Collector of Customs. A William B. Kingswell appears in the 1855 and 1858 Jury lists for Van Diemens Land (Tasmania). Above: CANTON. New Bedford. 239 tons. Built at Swansea. 1835. (Wood). Brodie Collection, La Trobe Picture Collection, State Library of Victoria. KINGSWELL – On the 23rd February, at the residence of her son-in-law, Edwin Cummings, Esq., River Don, Mrs. Mary Kingswell, late of Chippenham, Wiltshire, England, aged 77 years. (Bath papers please copy). This old respected colonist died on the 23rd February, at the residence of her son-in-law, Mr. E. Cummings, Don. Our correspondent writing on the 28th Feb., says: “Mrs. Kingswell had been on a visit to one of her daughters, Mrs. Robinson, in Victoria, and while there was taken with dropsy. Though very ill she wished to return to Tasmania, for she felt that her end was drawing near. Her medical adviser stated that it would be certain death to attempt to remove her, and especially to put her on board the steamer; but the old lady was resolved on making the effort, as she did not like the idea of being buried amongst strangers. She arrived here per s.s. Argyle in a very feeble state, accompanied by another of her daughters, Mrs. L. Grant. She seemed to rally greatly, and we began to think that she would be spared for some time to come; But on the 19th or 20th she began to sink rapidly, and it became plain to all that her time was close at hand. She spoke of her death and funeral with the greatest composure. 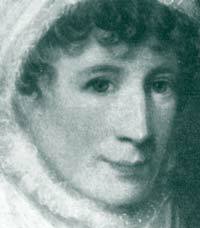 Mrs. Kingswell had been about 36 years in Tasmania, and was about one of the oldest members of the Congregational body. And though she had attained the age of 77 years she was very active, and not long ago took a trip to New Zealand, where she went about with as much ease as many younger women. She will be greatly missed in our circle as she was a constant visitor in cases of sickness, and had a kind word for everyone, particularly the young people, and was a great friend to the Church and Sabbath School. Her remains were interred in the Don Cemetery on the 25th Feb; Rev. T. E. O. Mell officiated at the grave. About 100 persons were present. christened 19 May 1823 at Morgans Hill Independent, Bradford On Avon, Wiltshire, England. christened 19 February 1823 at Castle Combe, Wiltshire, England. Died 1894 in Pland, Victoria. Awkwardly, her tombstone states that her mother was Mary Hilder! (and father of William Kingswell). Married Charles Vallance Robinson (baptised 21 Aug 1825 in Bermondsey, Surrey and died later thanMary Ann) on 30 September 1848 in Launceston. In 1851 Charles began an Auctioneers business and then buying ships. He, and Mary Ann, sometimes made journeys from Launceston to Melbourne. The ships he owned or part owned are, SS Gazelle,1860, Royal Shepherd, Gem, Titania (wrecked 15 July 1865 without lost of life on the Hokitika bar, NZ) Havilah, Black Swan, Helen McGregor (named after his sister Mary’s 5th daughter). He formed an alliance with James Lilly and set up a steamship company travelling from NZ to Tasmania and then along the Victoria and SA coast. He was residing in Bell Hill, Dunedin for at least 8 years (1856-1862+) as co-owner of, and agent for, Titania. (see notes below). In 1878 he bought the Rob Roy sawmill from Edwin Cummings (his brother-inlaw, who had become bankrupt) although Edwin remained manager. He built a house in 67 Gawler Street Pland, Victoria (which is still standing) and later died there. He also had property in Percy St. where he is listed as a bark merchant (for tanning). This branch of the family appear to be the first of this generation that left Tasmaina and may hav einfluced the later move of William B Kingswell and family in 1863. William B Kingswell born circa 1826. Sarah Kingswell, born circa 1828. Died 3 August 1916. Married John Gray, 8 December 1853, in Launceston Tasmania. Married again, date unknown, Mr Lewis Grant (obits for Lewis and Sarah below). Harriette Kingswell born in 1831 and died 19 October 1890 in Port Frederick, Tasmania. She married Rev. Malcolm Duncanson (born 1828 and died 26 September 1888, in Deloraine) on 10 June 1856, in Launceston. Agnes Harriet Duncanson, born 7 November 1861 died, 23 June 1862. Malcolm McLeod Duncanson, born 14 April 1863, Campbelltown, Tasmania. Jessie Harriet Duncanson, born 30 March 1867, Campbelltown, Tasmania. Elizabeth Hilda Kingswell, born in Launceston, Tasmania 1841. She married, 26 April 1859, Edwin Cummings in Launceston. Edith Leroy Cummings, b. 28 February 1863, Pt Sorell, Tasmania. Charles Edwin Cummings, b. 1 February 1865, Pt Sorell, Tasmania. Lewis Bently Cummings, b. 30 November 1866, Pt Sorell, Tasmania. Edith Caroline Cummings, b. 19 November 1871, Pt Sorell, Tasmania. Edwin Leroy Cummings, b. 15 July 1874, Pt Sorell, Tasmania. Douglas William Cummings, b. 15 May 1876, Pt Sorell, Tasmania. Edwin Cummings was a business man of some repute; Cummings, Henry, and Co., River Don, which finally was merged into the River Don Trading Co.
“History of the Deloraine Municipality” J. R. Skemp, Tasmania, Australia 1964 (copy held at University of Melbourne). Chapter ‘Municipal Government’, page 31, W. B. Kingswell listed as a trustee of the Road Trust in December 1855 (other trustees included Charles Field and John Field). A key area for introducing roading was to the settlers and farmers of Whitefoord Hills. The funeral of the late Lewis Grant will leave his late residence, Penguin, at 9.30 a.m. Thursday, February 1, and arrive at the Don Cemetery at 2 o’clock. Friends are invited to attend. D. Hall, Undertaker. Mr. L. Grant passed away on Tuesday morning at his residence, Penguin, at an advanced age. He had been a great sufferer for a long while, and his end not unexpected. Mr. Grant was well known at the Don and Devonport, where he carried on a general store for a number of years. A well-known resident of the North West Coast passed away in the person of the late Mr. Lewis Grant, yesterday morning, at the age of 75. Mr. Grant was a native of Montreal, Canada and arrived with Mr. Cummins at Don 45 years ago. His sterling upright character, his wonderful cheerfulness during years of suffering endeared him to a large circle of friends, who sympathise with the widow, whose burden of sorrow has been heavy. The deceased gentleman leaves no children. The funeral will take place tomorrow leaving deceased’s late residence at 9.30 a.m.
GRANT – On the 3rd August, at Devonport, Sarah Grant, relict of the late Lewis Grant, in the 89th year of her age. The funeral of the late Sarah Grant will leave the residence of Mrs. M. E. Northrop, Best Street, at 2.30 p.m. on Saturday the 5th inst., for the Don cemetery. England, and landed in Launceston, which was a mere hamlet then, 76 years ago. Since growing to adult age, deceased lived chiefly at Don, Devonport, and Penguin, coming to Devonport ten years ago, on the death of her husband. The late Mrs. Grant was a true type of “mother of Israel”, and was popular with and respected by all. Her end came suddenly. Half an hour prior to her demise, she appeared to be in normal health but collapsing, she suddenly passed away. The deceased lady had been actively associated with the Congregational church for many years and years ago was a Sabbath schoolteacher in that church. She took a keen interest in religious affairs. The funeral leaves the residence of Mrs. M. E. Northrop, Best Street, at 2.30 on Saturday for the Don cemetery. The funeral of the late Mrs. Grant took place at the Don cemetery on Saturday afternoon last. There was a very large gathering of residents of the Don and along the Coast, many of the old identities being present to pay the last tribute of respect to one they had known so long. The Rev. Owen Lewis conducted the services of the Congregational Church at the graveside, and the pallbearers were Messrs. J. T. Henry, S. Priest, E. Ingledew and A. J. Stokes. 3. Correspondance with a decesentant of Charles Vallance Robinson – April 2010. Charles gives extensive edvince in 1865 (printed in the Otago Witness) as co-owner of Titania, in the trial of Capt Jarvey for poisoning his wife. Possible match as the parents of William Kingswell. Born, 1780, Shanklin, Isle of Wright, England. On 13 November 1801, he (grocer, age 22) and Ann Allen (spinster, age 21) sought in Newport, Isle of Wright, a marriage licence in the registry of the Bishop of Winchester, Hampshire. The Kingswell’s appear to have been non-conformists. And, their marriages and christenings are hard to find in the parish registers where they lived. It is therefore likely that they would be more likely to have a marriage licence and not have held the wedding in a recognised church. These generations appear to have regularly moved. This couple are the right age. There are a lot of Kingswell in the Isle of Wright – many share familiar names used in later generations of our Kingswells; Mary, Ann, Mary Ann, William, Charles and George. The trap here is in assuming because of similar names that they must be related and ignoring that these where very widely used names. Many of the Kingswell’s of Isle of Wright appear to be nonconformists.